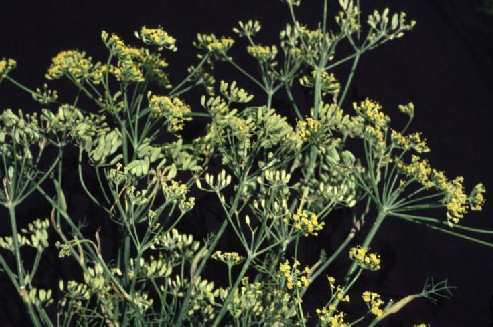 In large parts of Asia, fennel and anise given the same name (see below). Fruits (usually mistermed seeds ) . Other than most of their relatives, they retain a green colour after drying. As a rule of thumb, a bright green colour indicates a good quality. 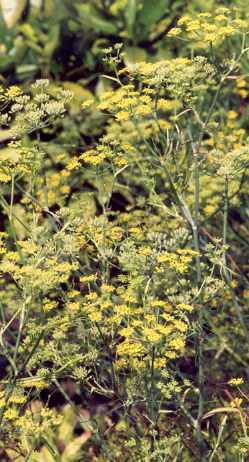 In Italy, there is also small-scale usage of fennel pollen as an expensive and rather extravagant spice. 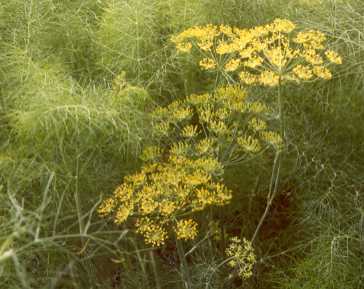 Also known as Spice of the Angels , fennel pollen is also produced in California as a small-scale exotic crop. 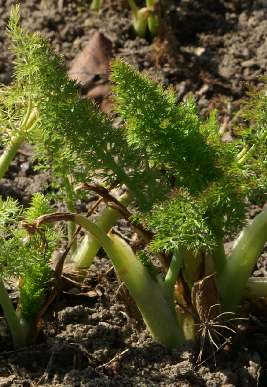 The leaves and stalks of fennel can be eaten as a vegetable. Italian breeds with fleshy stem and leaves to be used as a vegetable are often referred to as Florence Fennel or Finocchio in English, but the name finocchio may mean any type of fennel in Italian. Fennel pollen, also known as spice of the angels , has a subtle fennel flavour, lacking some of the sweet­ness but with a distinct note of pine needles (though others might disagree with this as­socia­tion of mine). The dried fruits of wild fennel (traded only in small scale) have a similar scent. The content of essential varies strongly (0.6 to 6%); fruits in the center of an umbel are generally greater, greener and stronger in fragrance. Time of harvest and climate are also important. 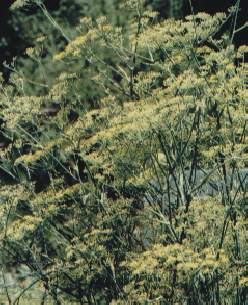 The essential oil of the most important fennel variety (var. dulce) contains anethole (50 to 80%), limonene (5%), fenchone (5%), estragole (methyl chavicol), safrole, α-pinene (0.5%), camphene, β-pinene, β-myrcene and p-cymene. In contrast, the un­cultivated form (var. 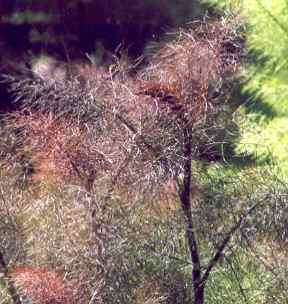 vulgare) contains often more essential oil, but since it is charac­terized by the bitter fenchone (12 to 22%), it is of little value. Medi­terra­nean. The plant’s popu­larity spread north­wards during the Middle Ages, when it was grown in monas­teries (see lovage). The genus name foeniculum (Latin for little hay ) probably refers to the aroma of fennel and is the source of the name of fennel in many con­temporary Euro­pean languages. Examples are German Fenchel, Italian finocchio, Portuguese funcho, Swedish fänkål, Dutch venkel, Finnish fenkoli and Russian fenkhel [фенхель]. There are, however, a couple of similar names referring to fenugreek in some European tongues that likewise derive from the same Latin word foenum hay . Some languages do not distinguish clearly between fennel and anise. 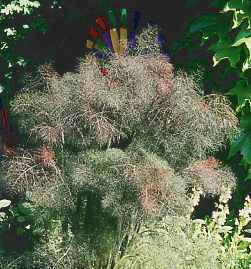 For example, in Amharic, the name insilal [እንስላል] may stand for fennel, anise and even dill. In Hebrew tongue, the term shumar [שומר] fennel may also used for anise, although there is a separate name for the latter, anis [אניס]. 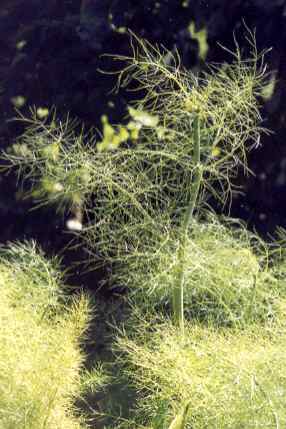 Moreover, dill has a very similar name: shamir [שמיר] — to make things worse, ash-shamir [الشمر] is the name of fennel in Arabic! Also in Romanian and Turkish languages, one finds identical or very similar terms for fennel and anise, which might fool a cook (or cookbook writer). 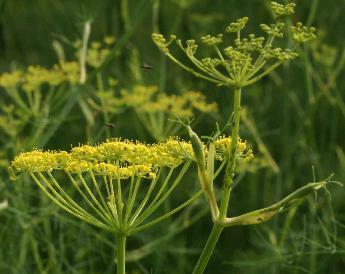 Some European languages name fennel as a pharmaceutical variant of dill, e. g., Estonian apteegitill and Russian aptechnyi ukrop [аптечный укроп] pharmacy-dill . 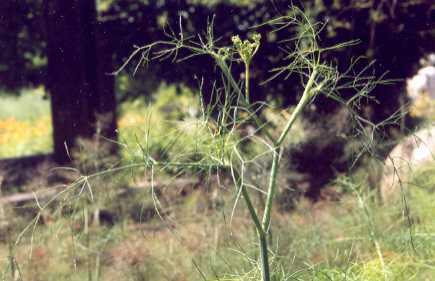 On the other hand, a Yiddish name of fennel is italienisher koper [איטאַליענישער קאָפּער] Italian dill . In the Hindi tongue, anise and fennel are often syn­onymously called saunf [सौंफ] although of the two spices, only fennel is common in Indian cuisine. To make a clear distinction between the both, fennel may also be called moti saunf [मोटी सौंफ] thick fennel , because its fruits are somewhat larger. Similar relations between the names of these two spices are also found in some other Indian languages, but the Urdu tongue closely related to Hindi has distinct names for fennel (saunf [سونف]) and anise (anisuan [انیسواں]). Many other Indic names of fennel derive from a word for sweet , e. g., Oriya modhuri [ମଧୁରୀ], Bengali mouri [মৌরি] and Sanskrit madhurika [मधुरिका] See licorice and bear’s garlic for details on the Proto-Indo–European root MEDʰU sweet . In Sri Lanka, there is an apparently similar name maduru [මාදූරු], but I doubt whether it belongs to the same kin: There is an alternative Sinhala name maha-duru [මහදුරු] large cumin , of which maduru could be a contracted form. A curious outsider among the Indian names is Kashmiri badyan [بادین], which almost everywhere else stands for star anise. The Indonesian name jintan manis sweet cumin (also applied to anise) reflects the much greater importance of cumin, of which fennel is thought to be a variety, in Indonesian cuisine. Analogous formations are French aneth doux or Russian sladkij ukrop [сладкий укроп] sweet dill and Hungarian édeskömény sweet caraway . All these spices (anise, cumin, dill, caraway) belong to the same plant family (Apiaceae) and, in varying degree, resemble each other in shape and fragrance. See also cicely. The Modern Greek name for fennel, maratho [μάραθο], can be traced back to Ancient Greek marathon [μάραθον] (the oldest recorded form is mara­thuwon [𐀔𐀨𐀶𐀺] on the Linear B tablets); possibly, there is a connection to the Indic names mentioned in the previous paragraph. Names derived thence are found in Coptic (malatron [ⲙⲁⲗⲁⲧⲣⲟⲛ]) and in a small cluster of South East European languages: Albanian maraja, Bulgarian morach [морач] and Romanian mărar; the latter, however, has changed its meaning to dill , again emphasizing the widespread confusion between those two plants. Marathon [Μαραθών] (Modern Marathonas [Μαραθώνας]) is also the name of a famous site in Attica, where the Greeks defeated the Persians in 490, thus laying the foundation for the later glory of the classical era. The placename is said to refer to the abundance of wild fennel growing there. The island capital of Madeira, Funchal, certainly got its name from the abundant fennel plants (Portuguese funcho). Another group of related names can be spotted in the tongues of Western Asia: Turkish rezene (hence Bulgarian rezene [резене] and Macedonian razijan [разијан]), Kurdish dhaziana [ذازیانة] and Farsi razianeh [رازیانه]. I do not know anything about the origin of these names. Fennel fruits, often referred to as fennel seeds rather inaccurately, are an ancient spice of the Mediterranean, known by the Greeks since three millennia. In the course of time, fennel usage spread both to the East and to the North, which is why fennel is now part of Northern European cookery as well as of East Asian cooking. Quite often, salty foods receive only a small dash of fennel — so small, indeed, that fennel’s importance is easily overlooked. 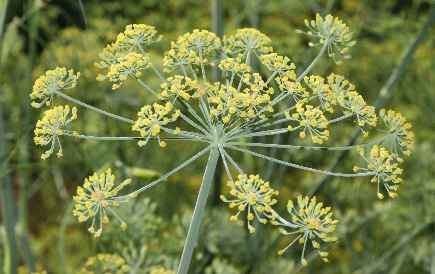 Fennel is quite im­por­tant in several regional cui­sines of the Indian sub­continent, parti­cularly in Bengal, where it is part of the typical five-spice-mix panch phoron (see nigella). Fennel usage is, however, not re­stricted to Bengal: In Kashmir, I once had an ex­cellent duck flavoured with toasted fennel; in Sri Lanka, toasted fennel fruits are one of the typical in­gredients re­spon­sible for the subtle and complex aroma of fiery and chile­laden curries. The toasting procedure not only increases the flavour, but also changes the character of fennel to a more spicy and less sweet impression. Fennel is much used recipes from Iran, Arabia and the Levant; it is also well estab­lished in Central Europe, chiefly to flavour rye breads, where the com­bination of sweet fennel and earthy bread is particularly delightful (see also blue fenugreek for dark breads); moreover, fennel is often used for pickled vegetables and herbed vinegar (see dill). Last but not least, fennel is part of many sweet pastries. Only in the last application, anise can be used instead of fennel, although the flavours will differ. As fennel is native to the Medi­terra­nean, it is most typical for the cui­sines of Southern Europe. It is used for meats and poultry, but even more for fish and see food. Fennel is rather popular in Southern France and often contained in the Provençal spice mixture herbes de Provence (see lavender). Italians are particularly fond of fennel, employing it for many different kinds of foods, e. g., for sausages or pasta sauces. It is often contained, together with herbs (thyme, oregano), in olive oil based marinades for vegetables and, sometimes, sea foods. The marinated vegetables are usually eaten as appetizers (antipasti), together with white bread and red wine. Fennel pollen has a spicy–ethereal fennel scent that best complements fruity flavours as found in Italian food, particularly in South Italy. For example, I like risotto with tomatoes, fennel pollen and a hint of thyme. Being less robust than fennel fruits, fennel pollen should be added late in the cooking process, or even just before serving.